NASCAR’s Kurt Busch testifies ex-girlfriend is a trained assassin. 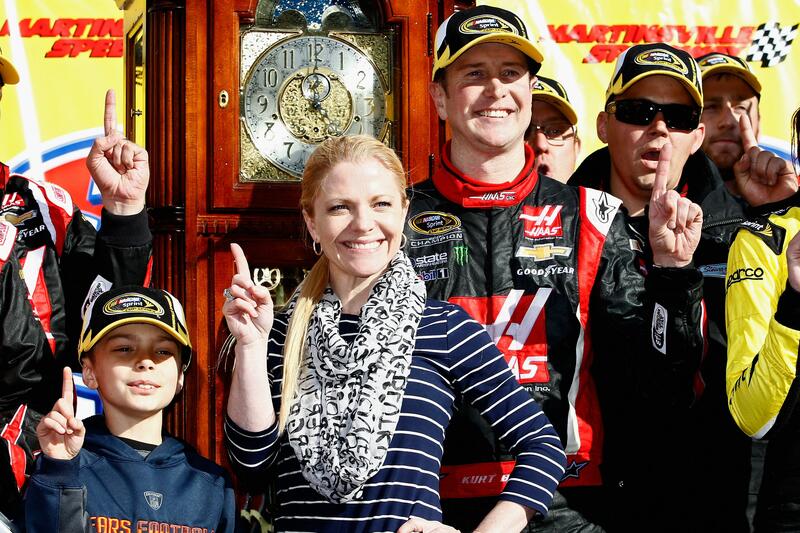 Kurt Busch celebrates in Victory Lane with his girlfriend Patricia Driscoll in March 2014. There are, of course, two sides to every story, but NASCAR driver Kurt Busch’s side is so utterly bonkers it’s almost impossible not to rubberneck. Here’s the situation: Busch and his ex-girlfriend Patricia Driscoll ended their four-year relationship last year. That’s when things got ugly and, Driscoll alleges, physical—leading her to request a no-contact order against the 36-year-old driver. Busch wasn’t happy about that and during a court hearing on the matter went after his former partner’s credibility. How? Here’s how: “[Busch] testified Tuesday he believes his ex-girlfriend is a trained assassin dispatched on covert missions around the world who once returned to him in a blood-splattered gown,” according to the Associated Press. Busch said Driscoll repeatedly asserted her assassin status and claimed the work took her on missions across Central and South America and Africa. He recounted one time when the couple was in El Paso, Texas. He said Driscoll left in camouflage gear only to return later wearing a trench coat over an evening gown covered with blood. A day earlier, Busch said his ex-girlfriend told him she was a mercenary who killed people for a living and had shown him pictures of bodies with gunshot wounds. Busch said Tuesday that Driscoll had claimed that a female character in “Zero Dark Thirty,” a film depicting the CIA’s hunt for Osama bin Laden, was a composite of her and other women. During the hearing, Driscoll did not refute Busch’s testimony, according to the AP. However, in an interview with the AP afterwards, “Driscoll called Busch’s assertion ‘ludicrous,’ saying he took it ‘straight from a fictional movie script’ she has been working on for eight years and that he has proofread.” The 37-year-old Driscoll lives in the suburbs of Washington, D.C. and is the head of two organizations: a veterans advocacy group and Frontline Defense Systems. Driscoll’s bio on the Frontline Defense Systems site certainly gives a shred of credibility to Busch’s claims. [Driscoll] has spent the majority of her career in the narcotics and intelligence world. While working abroad, many issues came up at home that brought her to Washington DC, where over the last 9 years she has developed strong relationships in the House, Senate, and the White House. Her strongest ally’s are the Armed Services Committee, Appropriations, Ways and Means, the Homeland Security Committee, and the Intelligence Committee. Must have been an interesting script Driscoll was working on for eight years.